So, here we are, it is Friday night and I can’t decide what to talk about. Originally, I was going to talk about marinated halibut, marinades in general, and an easy rice recipe. Although these all sounded good and things we will be sure to cover. I found that I was inspired by the weather to find something different to talk about. Even though I can make this recipe all year round, it of course is best served when it’s cold and blustery outside. 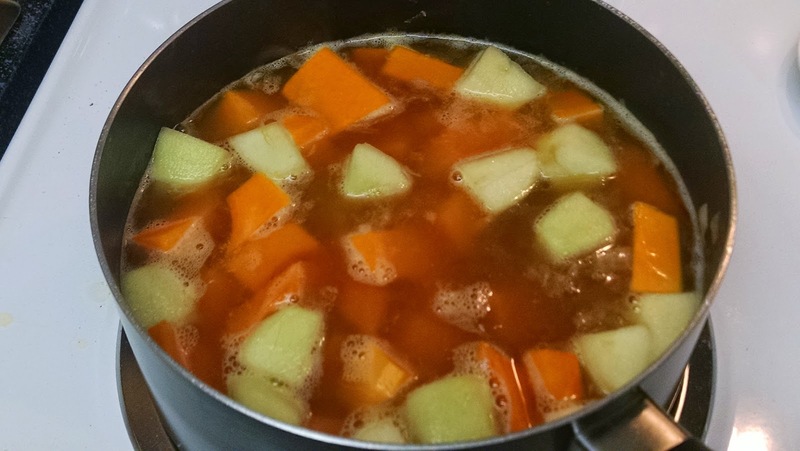 Tonight, we are going to be making Apple and Butternut Squash Soup. If the alarm bells are going off about how you can make this recipe, don’t worry. 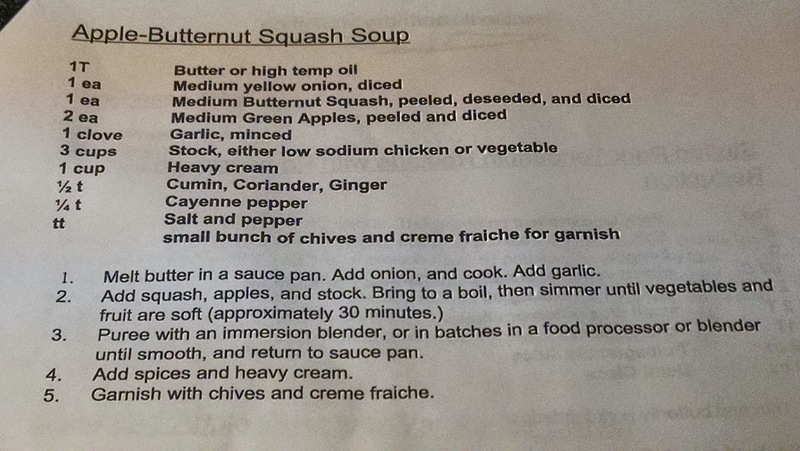 I know so many times soup recipes seem complicated and for some reason, really intimidating. This is the exact reason that I created this blog — to take that intimidation out of recipes so all food can be approachable no matter the skill level. 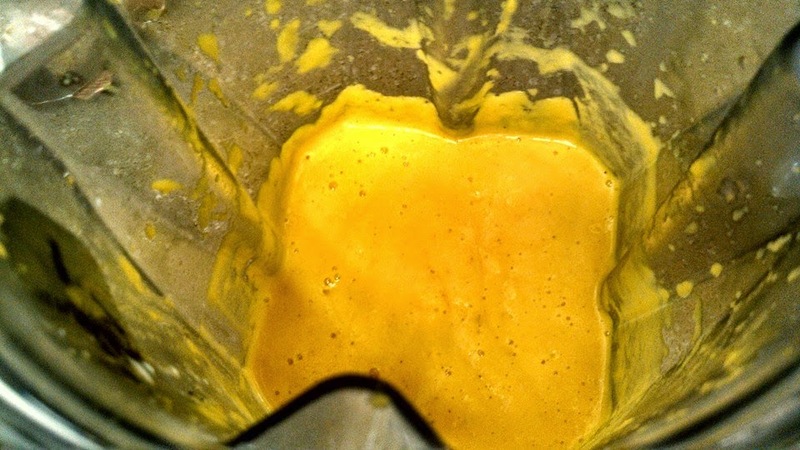 Second, this recipe is so easy, takes very little time, and is darn easy. 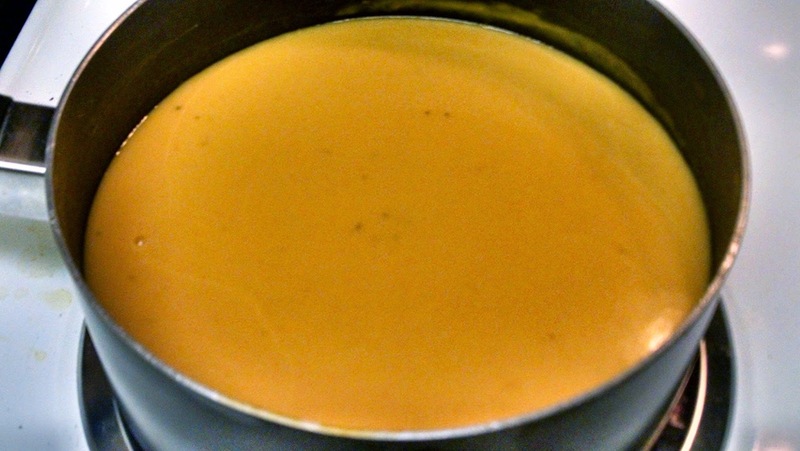 Although this is simple soup it packs a ton a flavor! In addition, this is something you will keep in your bag of tricks for when you want to cook for your family or have guests coming over for a dinner party. How do we make it? Just like this. We make a few adjustments, but do what suits your tastes the best. Our big adjustment is using 1/4 tsp versus 1/2 tsp of cumin. As you may know from experience, cumin, while great, can be very, very overpowering and can take over a dish. We made that mistake once with a different butternut squash recipe. Remember, you can always add more, but it doesn’t really work the other way around. We also use a little less cayenne too. Some people are sensitive to spice/heat levels, so know your audience. Here are a few more photos to give you an idea. By a few photos, I mean 3. Yes, that is all you need. 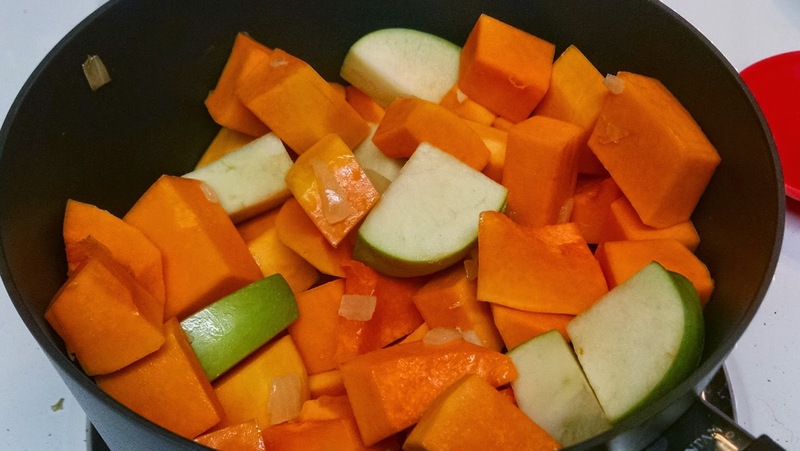 Here is the apple, butternut squash, garlic, and onion spending a little quality time together. This is same picture as above after the liquid has been added. In case chicken broth isn’t your thing, no problem — you can always use turkey, vegetable, or any other broth that fits your needs. Also, I recommend using low sodium broth instead of the full salt versions. The reasons are pretty clear, but by the time you add all the broth with the full sodium your soup could be overly salted. Also, on that same note, for those who want to know what goes in our food, this is a great way to control how much goes in it. After a spin in your favorite blender, food processor, or you can use a stick blender if you prefer, your soup is ready to go! I like to give the soup a little more time on the heat, so I put it back on the stove to make sure it is warmed through after its trip through the blender. This is a filling soup that easily can be a meal, but it could always use a little crusty bread, a grilled cheese, or some roasted nuts (homemade of course). Don’t worry, we’ll get to all those recipes too. Lastly, the recipe says to garnish with creme fraiche and chives. Truthfully, while this can be a nice touch for presentation, this soup doesn’t need it. Get your hands off my florets! The Launch of Patrick’s Table Logo! Big News for Patrick’s Table!